Here’s a tip – always check your Grub before filling it with food. 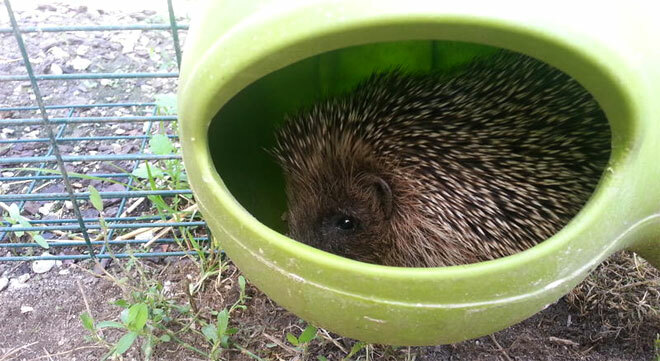 Eglu owner Kerry made a rather prickly discovery in her hens’ favourite feeder when she went to top it up recently. We’re not sure what the chickens made of the new house guest, but we think it’s rather adorable. Who know’s whether the clever hedgehog decided to climb in for some food, or just for a bit of peace and quiet… Either way, it got us wondering, what other uses are there for a Grub? Tell us a story or send us a photo and you could win a shiny new Grub and Glug. And another tip – if you like chickens, read on for an eggsclusive offer from Your Chickens Magazine. Thinking of adding some hens to the family? Now is the time to do it. They will provide great hentertainment for your kids over the last couple of weeks of the holidays, teach them the responsibility of looking after animals, and, of course, provide lots of lovely eggs for their sandwiches every day. Don’t wait until the Autumn. 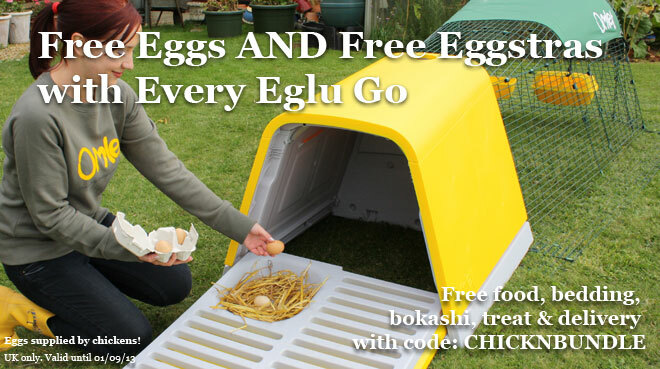 Order an Eglu Go, Cube or Classic this month and not only will you get free eggs every day, but we will throw in free Omlet Organic Chicken Feed, Easichick Bedding, Bokashi and a Poultry Corn ‘n’ Grit Treat too. Did we mention free delivery? Use code: CHICKNBUNDLE to save! 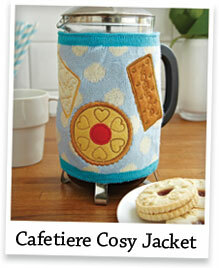 Valid UK, until 01/19/13. Like fun photos? Then ‘Like’ our Facebook page today! Post your own pics too and give us all a giggle! 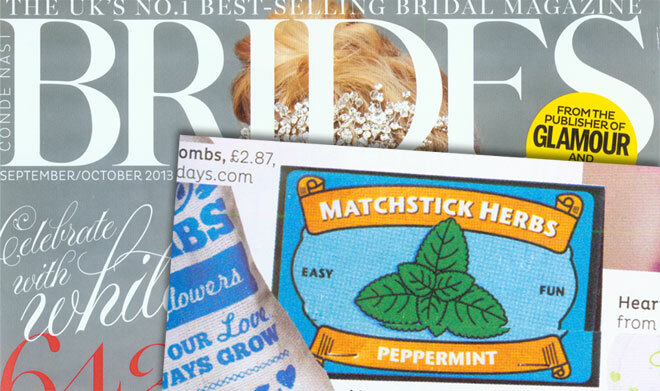 Looking for some wedding favours with a difference? Our Matchstick Gardens could be just the ticket! Featured in the latest edition of Brides Magazine, these nifty seed books are perfect for encouraging guests to “bloom into budding gardeners”. Forget sugared almonds, the Matchstick Gardens will give years of enjoyment, and they won’t crack anyone’s teeth. Every time your guests look at their home-grown beautiful flowers, or pick some herbs for their casserole, they’ll think of your special day. Enough soppiness for now. There are four types of Matchstick Herb and four types of Matchstick Flower available, at £1.50 each. You don’t have to be getting hitched to buy one either. Phew! Your Chickens magazine is perfect for the back garden chicken keeper. It is full of tips, advice and real life stories of people who have joined the chicken keeping boom – why not join our celebration of all things chicken? Try three issues for just £3 by Direct Debit and save up to 71%. After your first three issues, the subscription will continue at £10.99 every six months, saving 50% on the cover price! Just visit www.subscriptionsave.co.uk/omlet or call 0844 848 8056 and quote the code VYCOMLT1. Offer above by Direct Debit. Credit/Debit card rate is £25 a year (saving 40%). Saving based on the cover price of £3.50 and Your Chickens is published 12 times per year. Offer ends 31/12/13. Earlier this month we asked you to send us your suggestions of a name for the new giant blue cockerel in Trafalgar Square. We can now reveal the winning name is…………….. Colossal. Well done to John and Kymberley Stanton-Croft for winning this competition. Your doorstop, egg cup and mug will be flying over in a flash. If you want to say hello to Colossal, make sure you pay a visit to the Fourth Plinth. At 15 foot high, he’ll be hard to miss, and he will be roosting there for the next 18 months! There are just over two weeks left of Summer Free Delivery offer, so why not take a look at our online shop!? We add new products every week, and, for anyone with pets, it’s a great place to pick up all essentials like food and bedding. Stock up on our Organic Omlet Chicken Feed, prepare for Winter with an Extreme Temperature Jacket for Eglus, or treat yourself to some New Honey and Beeswax Summer Burst Hand Cream. Spend over £50 and we will give you free UK delivery. You could even start your Christmas shopping early! Chain Bridge Honey Farm Products – This range has been handmade in the Scottish Borders, using the honey and beeswax collected from 1,800 hives. 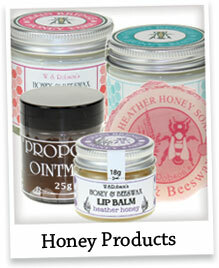 Find hand cream, foot cream, moisturiser, lip balm, soap and ointment. Prices start at just £2.75! 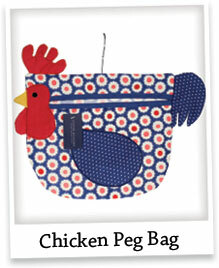 Chicken Peg Bag – Still keeping all your pegs in one basket? It’s time for a new henvestment. This hendy accessory is a pegcellent bag to use when you hang the washing out, and it makes the job a bit more pegciting.